Is Apollo Global Management LLC (NYSE:APO) a good equity to bet on right now? We like to check what the smart money thinks first before doing extensive research. Although there have been several high profile failed hedge fund picks, the consensus picks among hedge fund investors have historically outperformed the market after adjusting for known risk attributes. It’s not surprising given that hedge funds have access to better information and more resources to find the winners in the stock market. Apollo Global Management LLC (NYSE:APO) shares haven’t seen a lot of action during the third quarter. Overall, hedge fund sentiment was unchanged. The stock was in 22 hedge funds’ portfolios at the end of the fourth quarter of 2018. The level and the change in hedge fund popularity aren’t the only variables you need to analyze to decipher hedge funds’ perspectives. A stock may witness a boost in popularity but it may still be less popular than similarly priced stocks. That’s why at the end of this article we will examine companies such as Tableau Software Inc (NYSE:DATA), Alliant Energy Corporation (NYSE:LNT), and Apache Corporation (NYSE:APA) to gather more data points. We’re going to view the key hedge fund action encompassing Apollo Global Management LLC (NYSE:APO). At the end of the fourth quarter, a total of 22 of the hedge funds tracked by Insider Monkey were long this stock, a change of 0% from the previous quarter. 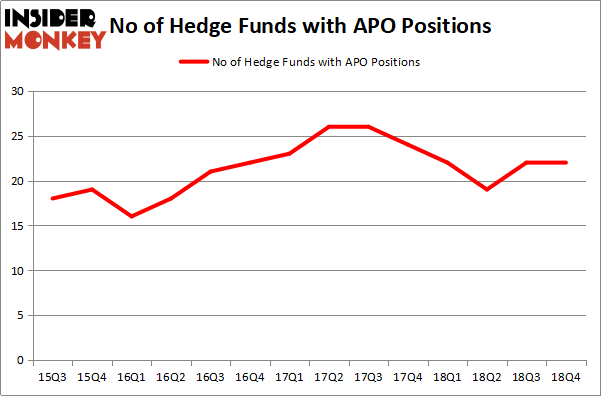 By comparison, 22 hedge funds held shares or bullish call options in APO a year ago. So, let’s check out which hedge funds were among the top holders of the stock and which hedge funds were making big moves. More specifically, Tiger Global Management LLC was the largest shareholder of Apollo Global Management LLC (NYSE:APO), with a stake worth $924.3 million reported as of the end of September. Trailing Tiger Global Management LLC was HMI Capital, which amassed a stake valued at $157.7 million. Alkeon Capital Management, Select Equity Group, and Markel Gayner Asset Management were also very fond of the stock, giving the stock large weights in their portfolios. Since Apollo Global Management LLC (NYSE:APO) has faced a decline in interest from the smart money, it’s easy to see that there is a sect of hedgies that decided to sell off their positions entirely in the third quarter. Interestingly, Chuck Royce’s Royce & Associates dumped the largest position of all the hedgies monitored by Insider Monkey, comprising close to $9.2 million in stock. James Dondero’s fund, Highland Capital Management, also said goodbye to its stock, about $2.1 million worth. These bearish behaviors are important to note, as total hedge fund interest stayed the same (this is a bearish signal in our experience). 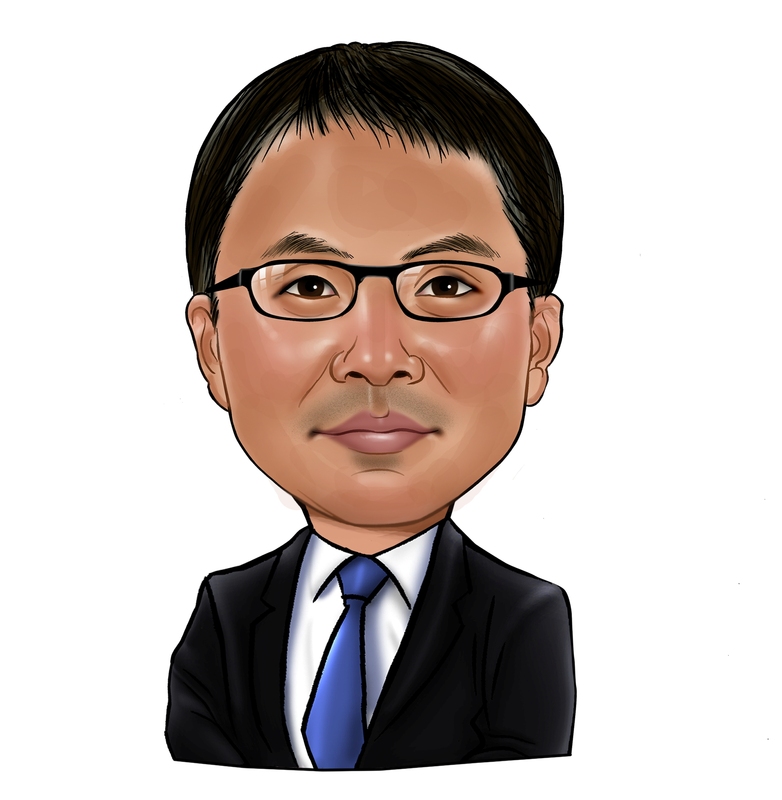 Let’s check out hedge fund activity in other stocks – not necessarily in the same industry as Apollo Global Management LLC (NYSE:APO) but similarly valued. These stocks are Tableau Software Inc (NYSE:DATA), Alliant Energy Corporation (NYSE:LNT), Apache Corporation (NYSE:APA), and FMC Corporation (NYSE:FMC). This group of stocks’ market valuations resemble APO’s market valuation. As you can see these stocks had an average of 31.25 hedge funds with bullish positions and the average amount invested in these stocks was $1177 million. That figure was $1244 million in APO’s case. Tableau Software Inc (NYSE:DATA) is the most popular stock in this table. On the other hand Alliant Energy Corporation (NYSE:LNT) is the least popular one with only 28 bullish hedge fund positions. Compared to these stocks Apollo Global Management LLC (NYSE:APO) is even less popular than LNT. Considering that hedge funds aren’t fond of this stock in relation to other companies analyzed in this article, it may be a good idea to analyze it in detail and understand why the smart money isn’t behind this stock. This isn’t necessarily bad news. Although it is possible that hedge funds may think the stock is overpriced and view the stock as a short candidate, they may not be very familiar with the bullish thesis. Our calculations showed that top 15 most popular stocks among hedge funds returned 19.7% through March 15th and outperformed the S&P 500 ETF (SPY) by 6.6 percentage points. Hedge funds were also right about betting on APO as the stock returned 20.8% and outperformed the market as well. You can see the entire list of these shrewd hedge funds here.